My camera rested on its tripod, focused on a mosaic above the base of the escalators. The inlaid red, yellow, gray, and blue marble looked like a Picasso treatment of a hammer and sickle, the pieces of this once dreaded symbol of Russian Communism coming together only when I blurred my vision. My finger was on the shutter button, but right as I began to apply pressure the viewfinder went black. Expecting a dead battery, I raised my eyes to find the lens was covered by a hand poking out of the sleeve of a coarse, olive-drab uniform still so popular among Eastern European police forces. “Zapreshyono!” the militiaman said in the lingua franca of Soviet — now Russian — officialdom: Forbidden. He was young, thin, and small, and although the assault rifle dangling from his neck looked menacing, he was not endowed with the innate humorlessness that characterizes most uniformed Russians. He frowned and stuck out his chest, but as he spoke the corners of his mouth turned up a little. “Are you a spy?” he asked. “Yes, a Polish spy,” I replied, but he could tell I was kidding. “Well, you can’t take pictures.” He rocked back on his heels and nodded for emphasis. We were standing in Marksistskaya Station in what could be described as suburban Moscow. Marksistskaya is far from the authority of the Kremlin, the tourists of Red Square, and the glamour of the capital’s glitzy new shopping malls; it is far from the diplomatic corps, far from train stations and fancy hotels, and far from the riches of the Russian State Bank. With the exception of the rock pastiche I was trying to photograph, Marksistskaya is unremarkable. It is Mayberry, and I was talking to the Slavic Barney Fife. “But it’s art!” I protested, gesturing to the Soviet trademark over his shoulder. He turned and looked and said, “Oh!” as if he had never seen it before (it is entirely possible that he had not). “Take your picture then,” he said and resumed his patrol. Had the creators of the Moscow Metropolitan Underground Railway, the Metro, been looking merely for efficient transportation, ground transport would have been the cheap and easy way to go on the nearly empty roads of 1930s Moscow. 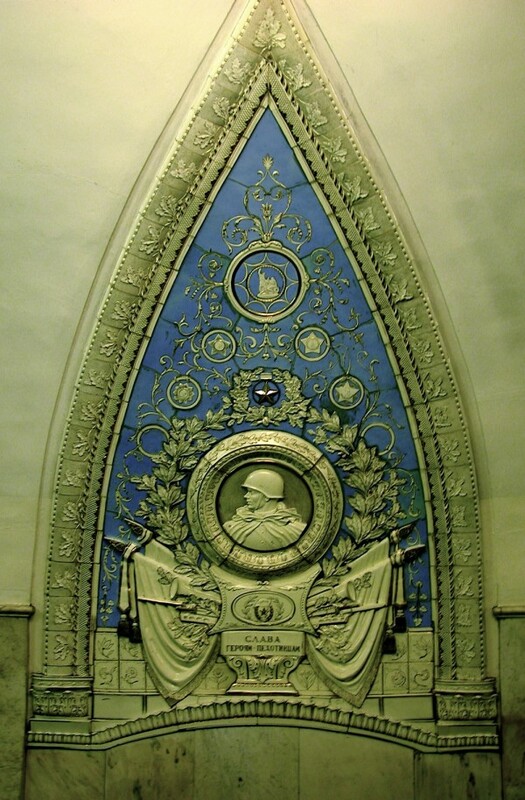 But the needs of the state extended beyond the mere movement of its citizens; the unprecedented depth (the deepest section being 276ft / 84m) of the Metro stations would provide bomb shelters in time of war, and the sheer opulence of the stained-glass windows, gilded capitals, mosaics, and ceramic murals would constitute a formidable propaganda tool. At least it would have nearly 80 years ago when the first trains rolled. 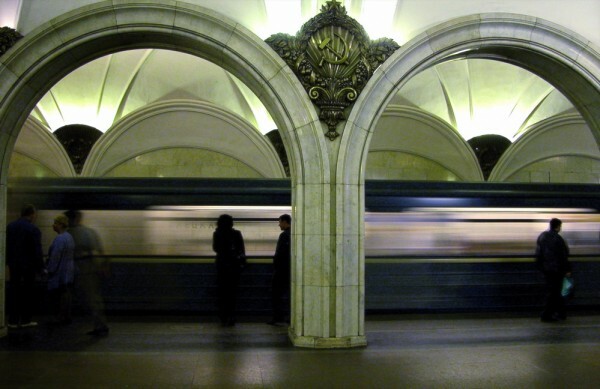 The number of those who remember a time when there was no Metro have dwindled to nearly nothing; subsequent generations have learned to take this steady and dependable staple of life in the Russian capital for granted. This change in attitudes is unremarkable. What is fascinating is how closely the Metro parallels life in the Russian capital; this is public transport as metaphor. The creation of the Metro makes for a great story. It was an effort of supreme difficulty, sacrifice, and, above all, expense. 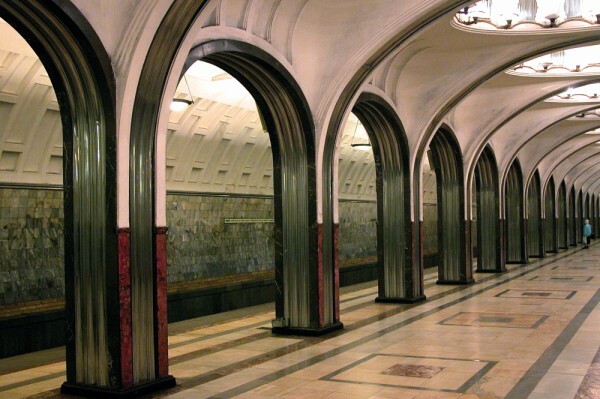 In 1934 alone, 350 million rubles were spent on the Metro. For perspective, only 300 million rubles were spent on consumer goods for the entire Soviet Union during the first Five Year Plan. It was a set piece with what was transpiring across the 11 time zones of the country. Super projects like the steel town of Magnitogorsk, the Giant collective farm, and the Moscow Metropolitan were no less than feats of optimism performed by the Soviet Union’s greatest generation. John Scott, an American who chronicled the construction of Magnitogorsk, recalled hope and optimism as common virtues among the men working under perilous circumstances to build that city. And those were mostly prisoners. It should be recalled that the peasants and workers who constituted the first generation of Soviets — and nearly every image in the Metro — placed their hopes beyond simply having a productive job and a decent place to live. Shortages of food and consumer goods were common, industrial accidents and deaths were frequent. They may have used steel and concrete and mortar and brick, but their faith was not in building factories or housing or public transport. The West already had these. Russia has long been a famously religious place; Moscow was once known as the third Rome. The Soviet authorities were essentially channeling this religious energy in a new direction. The generation that industrialized seemingly overnight and then went on to win the Worst-War-Ever was building heaven on Earth, a Valhalla they called communism. The Metro provided their temples. St. Peter and the other Christians of his era thought the rapture would come during their lifetimes. They were wrong, but their faith had much to offer — salvation, eternal life — and Christianity proved to have terrific staying power. Similarly, the early Soviets believed they would live to see the end of government and capital and the arrival of communism. Through subsequent Five Year Plans, wars, and famines, however, the promise that lay just around the corner began to seem more like a circle, an endless curve. Stalin’s successor Khrushchev was himself a true believer but nevertheless saw the need to mitigate his country’s perennial sacrifices. He spent less and built more simply. In the Metro, this change is clearly evident in the homely stations he had built in large numbers in the late 1950s and early ’60s, such as Bagrationovskaya (1961) or Prospekt Vernadskogo (1963). They added little aesthetically, but they did help many more people move around the capital. They were also a tacit admission that the dream of plenty would not come, and Soviet disciples became something else altogether. The Soviet Union would hobble along on the momentum Stalin had generated for several decades more. The state would be run by apparatchiks and all those little temples would be fiefdoms. They still are today. Descending the long escalators (the ride can take as long as 3 minutes with steps moving 3ft/second; they are among the world’s fastest) is one of the great pleasures of using the Metro. This is people watching at its finest. Unlike in airports, for example, where people sit or slowly walk by, in the Metro the people are arrayed in a straight line on an actual conveyor belt for ease of viewing. Since passengers have plenty of time, some people continue reading, others stare straight up, hoping for vertigo, and a few couples can usually be seen making out. The rest of us studiously stare across the two inoperable escalators — and there are always, regardless of the volume of traffic, two inoperable escalators — at the thick band of people moving the other direction while pretending to be looking at nothing at all. Had Orpheus been Russian instead of Greek, he almost certainly would have taken an escalator to the underworld. There should be a sign on the way down saying, “Now Leaving Moscow. Have a Safe Trip.” For all its beauty and charms, the Metro is, after all, buried. It can get stuffy and the lighting is not the best. Passengers are pop-in guests, descending into this netherworld only to materialize a few minutes later in some other part of town. They get to enjoy fresh air, even if an arctic breeze, and the occasional sunshine. A Metro employee, on the other hand, spends a third of her day underground. As engaging as I find people watching, I am sure it loses its luster for the ladies that sit in the booths at the bottom of the escalators after the first ten million or so people pass by (that’s after about a week). Perhaps it is the lack of daylight, or the feeling of physical separation from the rest of the city that causes this, but make no mistake, the station attendants and militiamen working the Metro rule their dominions, enforcing rules as they see fit. The Soviet Union may be gone, but the Soviet bureaucrat remains. “Zapreshyono!” the portly woman hollered as she shuffled toward me, passing beneath the mosaics in their false cupolas in Mayakovskaya. 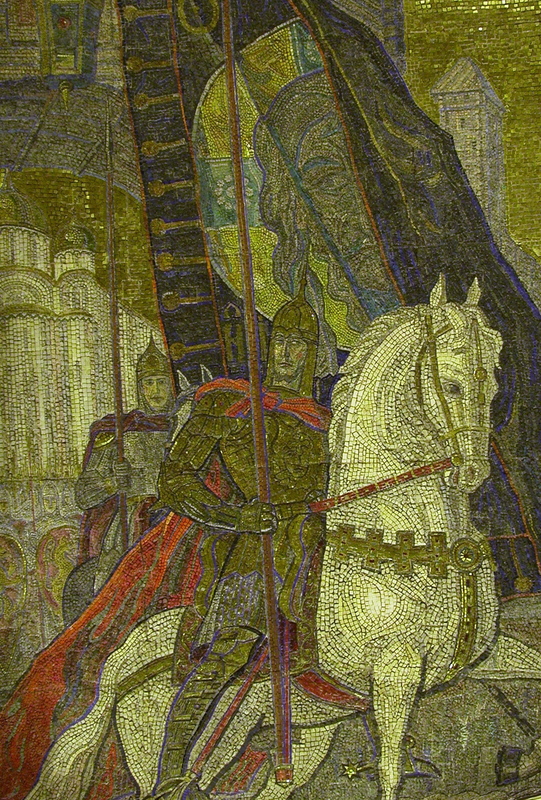 This was the masterpiece of the famous sculptor Deineka, who designed the ceiling mosaics. This was the station chosen to celebrate the 24th anniversary of the October Revolution in 1941, a scene painted and reproduced around the USSR. With the mosaics, red marble columns, and stainless steel ribs, Mayakovskaya is popular among tourists. Surely here photography would not be impeded. “Yes, but you can’t use the tripod,” she said with finality. I was reminded of those Japanese soldiers stuck on little Pacific islands that never learned the war was over. Other passengers got in my way too, so in the process of visiting all 188 stations of the Moscow Metro I usually planned my visits in off-peak hours. It was 10:30 on a Sunday night and we were the only two people in the station. “But there’s nobody here!” I said. “It is forbidden.” There was no convincing her otherwise. Other tactics had to be employed. After my encounter in Marksistskaya, and despite the tripod incident, I felt certain that I could. “Zapreshyono!” he said again and began struggling to his feet. I instinctively helped him up, only for him to stand in front of my camera and firmly plant his feet. “Where’s your uniform?” I asked. “Zapreshyono!” he said with finality. After meeting that old fellow, I had time to think about what he had been doing there. He could have been waiting for someone, or perhaps he had worked on this station and came by to admire his handiwork, or maybe to recall better times. Or worse, he may have used the Metro as a safe, inexpensive place to be among people, for it represents a painful paradox in the Russian capital. The journalist David Remnick has pointed out that while the Soviet Union was poor, everyone was equally so. More or less anyway. War veterans did not beg, old women did not collect beer bottles for the return deposits, and children did not play the violin for loose change. The stereotypes of capitalists the early Soviets feared have all been realized in modern Moscow, found in the labyrinth of the Moscow Metropolitan. Through the vicissitudes of the Metro, it has closely paralleled the life of the nation. Stalin’s stations were impressive, even awesome, but built by terror. Khrushchev’s were parsimonious but safe. Brezhnev oversaw a period of high wages on which the workers had nothing to spend. His stations are expensive looking but mostly pointless. Into the 1990s the stations were eclectic, a nation trying to find its footing again. 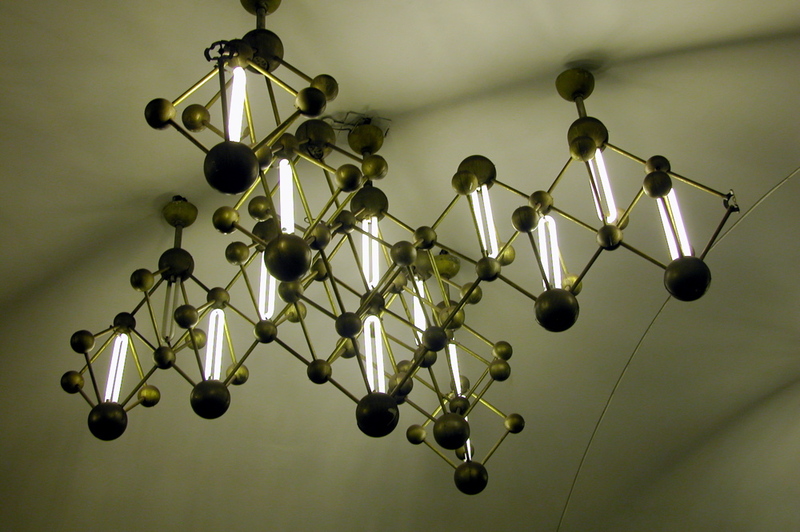 Oil money in the 2000s led to flashy station interiors to match the glitz of modern Moscow’s glass-and-steel skyscrapers. Yet there is a consistent theme underground. The Metro is a microcosm of what communism was supposed to be, a classless realm in which all comers rub elbows as equals. On the surface, Russians are subjected to fairly rigid class distinctions. The glitzy shops on Tverskaya Ulitsa, a Russian Rodeo Drive, are the domain of the small upper class, just as some of the seedier traktiri (loosely translated as “inns”) and beer stands are the stomping grounds for Moscow’s less desirable elements. But on the train, the seats are first come, first served. The elderly, the infirm, and women with children are afforded some level of comfort, given seats by their more chivalrous fellow travelers. The Metro effortlessly incorporates foreign students on their way to and from Moscow’s many institutions of higher learning, even the conspicuously dark faces of those from Nigeria and other African nations that have long found Russia a welcoming place to study. And tourists too may move about the hoi polloi of Russia with relative comfort and security. At least as much as is enjoyed by everyone else. I suspect that the Metro will join the ranks of the eternal in Moscow, right up there with the Kremlin and St. Basil’s Cathedral. As long as there are rubles — or maybe euros some day — in the Russian State Bank, these three entities will be protected and maintained. The Metro, however, will also grow. Unlike most of Moscow’s historical properties, it will be expected both to change and to remain the lifeblood of the capital. Muscovites pay little mind to Red Square, but they have to use the Metro. I came to understand the inherent vitality of the Moscow Metropolitan in one of the last stations I visited. Rimskaya was completed in 1995, one of the first stations conceived and built in the post-Soviet era. At the end of the marble-covered central hall there was a statue. This is a common layout for stations built over the last 25 years, but as I neared the display it struck me as odd. There were three pieces of a broken Corinthian column made of reddish marble, and on one of them two naked babies were playing. After a moment I caught the theme: On the ruins of the Soviet Empire the new Russian nation grows. “That’s clever,” I thought, pulling out my camera. Just then I noticed another young militiaman walking toward me and I sighed. After a pregnant pause he simply nodded and said, “Good evening,” and then turned toward the approaching train.